The iconic science fiction writer passed away on June 6, 2012. These are picks chosen by PRX editorial staff. You can see more pieces on Ray Bradbury by using our search. Explore Bradbury's terrifying vision of a future without books as the NEA discusses his groundbreaking 1953 novel, "Fahrenheit 451". This is a fascinating program with Bradbury featured throughout, explaining his inspirations and writing process. Ray Bradbury Shares How He Wrote "Fahrenheit 451"
A Literary Moment: Author Ray Bradbury discusses how he wrote his classic novel "Fahrenheit 451" in this one-minute piece. This Literary Moment is part of the NEA's Big Reads Moments. The Big Read is an NEA program designed to restore reading to the center of American culture by providing citizens with the opportunity to read and discuss a single book within their communities. In 2007, nearly 200 communities nationwide participated in the Big Read, reading one of twelve classic American novels such as "Fahrenheit 451" by Ray Bradbury and "Their Eyes Were Watching God" by Zora Neale Hurston. CyberFrequencies talks to Ray Bradbury about love! Ray Bradbury wrote a musical called "Wisdom 2116." He wrote it for an old couple he befriended as a young man. And it's taken Bradbury more than 50 years to see the musical performed on stage. Includes an interview with Bradbury. 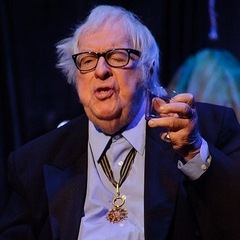 Ray Bradbury has a musical up in Pasadena called "Wisdom 2116." He wrote it for an old couple he befriended as a young man. And it's taken Bradbury more than 50-years to see the musical performed on stage. "Wisdom 2116" is a love story about the secret to staying young! We also spoke to the legendary science fiction and fantasy writer at his home in Los Angeles. He tells us about writing Fahrenheit 451 and the secret to living forever!